John Lennon was taken from us 38 years ago tonight. A day doesn't go by that I don't think about John. I try to always enjoy the music he gave us while he was here (and the new Imagine set has been a great way to celebrate John's music recently), but I can't help but wonder what more he could have given us if he hadn't been so violently taken from us in 1980. That idea hit me really hard this year when Paul's new album was released. I tried to be excited about the new Paul item, but I felt a little angry and bitter that John didn't get the chance to release anything new since Milk & Honey in 1984. It doesn't surprise me that after John was killed, fans got together to mourn. It also doesn't surprise me that stores sold out of the new Double Fantasy album or that new fans got to know John and the Beatles after his death. 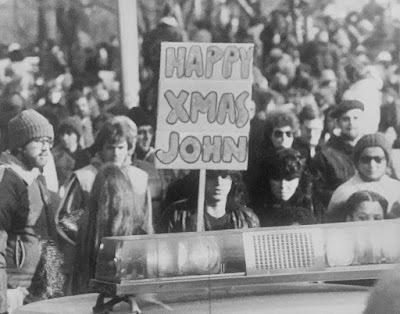 So here we are on yet another December 8, and I hope all of you who also love John and appreciate his music, take a small amount of your busy Saturday to celebrate the life of John Lennon. -Twitter. 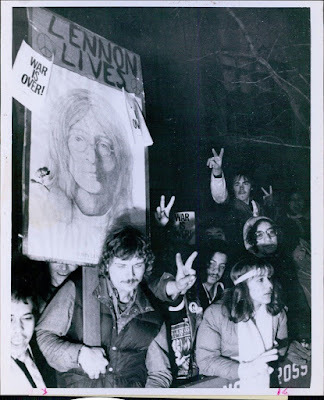 Can you IMAGINE Lennon on Twitter? I live in New York. I went to Strawberry Fields last night where people gather each year. It was lovely. Will always miss John Lennon. John made one big mistake in his life, which cut it short. Instead of living in the safety of the English countryside, he moved to a place full of nutcases and guns. "safety of the English countryside" - tell that one to George Harrison.